Candidates would need to register through One Time Profile Registration (OTPR) portal and obtain OTPR id (if not done already) when they start filling the application form. 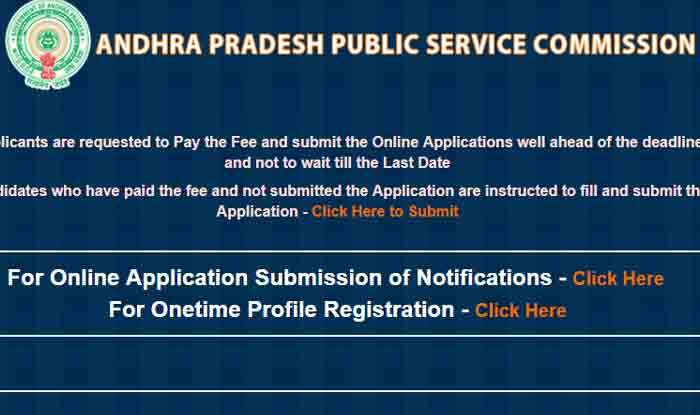 APPSC Notification 2019: The online application submission process Panchayat Secretary posts in Andhra Pradesh Panchayat Raj Subordinate Service will end on January 19, Saturday. Interested candidates were advised to deposit their exam fees before Jan 19 midnight. The registration portal is available at the official website of Andhra Pradesh Public Service Commission (APPSC). Candidates would need to register through One Time Profile Registration (OTPR) portal and obtain OTPR id (if not done already) when they start filling the application form. Once a candidate has their OTPR id, they can log in to their account and apply for the Panchayat Secretary recruitment. Step 1: Visit the APPSC official website- psc.ap.gov.in. Step 2: Click on the link that reads- ‘APPSC Panchayat Secretary Exam 2019’. Step 4: Your registration will be done. Pay your fee for the exam. Step 5: Download your application form and keep a copy for future use. It must be noted that an offline screening test will be conducted in April by the Commission if the number of applicants exceeds 25,000. The main exam, which will be a computer-based test, is likely to be held on August 2. There would be objective type questions which are to be answered on the computer system. In case any paper of the examination is held in different languages, the candidate has to choose the medium in which he/she wants to write the examination and the paper will be valued with reference to that medium only. Mock test will be hosted by the Commission and candidates can access it online. Candidates have to pay Rs. 250 as application processing fee and Rs. 80 as examination fee. Candidates hailing from Andhra Pradesh and belonging to SC, ST, BC, PH and Ex-Service Men, Families having household supply white card issued by Civil Supplies Department, A.P. Government, and unemployed youth are exempted from paying the examination fee.